I have been holding off on writing up a review of the Wacom Intuos3 graphics tablet until I had a chance to work with them for some time and really get a feel for real-world usage, particularly for cartoonists & illustrators. Oddly enough I had a hard time finding an in-depth review specifically geared towards artists that draw. There were some big questions that needed to be answered, most importantly that of how the Wacom tablets worked with Adobe Illustrator. In short, these things are phenomenally awesome, and worth every single last cent you pay for them. I liked the Wacom Intuos3 6×11 Graphics Tablet I bought for the desktop so much, and use it so much that I bought the smaller Wacom Intuos3 4×6 Graphics Tablet for my laptop. It fits perfectly in my STM Alley laptop shoulder bag along with my MacBook (I also recommend the Tom Bihn Absolute Comfort Should Strap as an upgrade to any laptop shoulder bag). 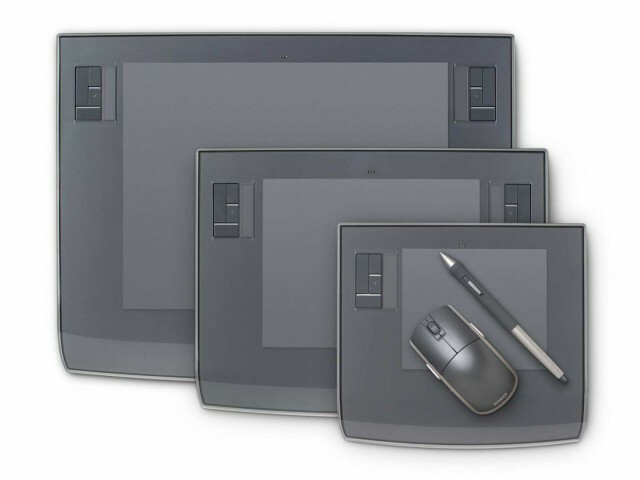 If you aren’t familiar with a graphics tablet, it’s pretty simple: it’s an input device accessory you attach to your computer that has a “live” drawing area, as well as a wireless pen & (crappy) mouse that you move over the live area, and it controls the mouse pointer on your screen. You usually hover the pen over the surface, and then tap to click, two taps to double click, and can drag & drop item just as you would with a mouse. There is no learning curve at all if you know how to use a mouse, and know how to use a pen or pencil. The Intuos line of tablets also have some other buttons that we’ll get to later. The other cool thing is that they are pressure-sensitive, which means they can act like a brush, where the harder you press, the bigger/darker the brushstroke. It’s all infinitely customizable in a Wacom-friendly graphics program such as Adobe Photoshop & Adobe Illustrator. Now, the versions I own are the top of the line Intuos3 models (although the Ã¼ber tablet over at Wacom, the Cintiq is actually an LCD monitor that you draw directly on! It’s also über expensive. And über cool.). Wacom (pronounced “walk-em”, although I still say “way-com”) also sells some less expensive models as well. – the Graphire series. The big difference being the extra doo-dads and the higher resolution & pressure sensitivity in the Intuos line. I went with the big daddy versions because drawing on a Mac is what I do most of the day, and I wanted the best tools and was willing to pay for them. You, dear reader, may be fine with the Graphire series. The price jump to Intuos is significant, but worth it. Why is pressure sensitivity and resolution so important? Well, it directly affects your interaction with the digital canvas. Higher levels of pressure sensitivity means the Photoshop & Illustrator brushes will respond more accurately to your pen strokes, giving you more control. The higher resolution means the pen is way smoother as you drag across the screen. A lower resolution tablet will be more “jumpy”, although I used to have a Graphire-equivalent Wacom years ago and it was great. The larger tablets give you more “play” in your brushstrokes/mouse movements. This can be a benefit if you draw widely and expressively (which I don’t). It could be a curse if you draw in small, measured lines (which I do). So why did I get the larger model? Well, I actually took a chance, and decided I would return it if I didn’t like it. But I did. I like that my small movements were not exaggerated. A smaller tablet will do this, since you are “mapping” the tablet’s live area to the actual screen. So, a small flick of the pen on a smaller tablet when using a large monitor will result in a huge mouse movement. When using a larger tablet, this is minimized. For some, this may not be desirable, but I like it that way. If you don’t want to move your hand & arm as much, get the smaller one. I feel as if it gives me much more control over the mouse movements. So, now we know how to choose one, but will I like using it, particularly in Adobe Illustrator? The answer is a resounding yes! The surface of the tablet’s drawing area is silky smooth, and drawing the pen across can be a satisfying experience on it’s own. I know that sounds weird to say, but once you try it out you’ll know what I mean. It’s just so exactly how you wanted it to feel, even more than you realized was even possible. Your productivity will blast into the outer regions of the solar system, trust me. Try the Wacom pen out with the Illustrator brush tool and you will be blown away. It literally will put a huge grin on your face. The effects are equally awesome in Photoshop. If you were, like me, wondering how well a graphics tablet works in Illustrator, trust me it will blow your expectations to smithereens. The Intuos tablets have customizable buttons on the sides of the tablet which default to the standard modifier keys on a Mac keyboard: Control, Shift, Option, and Command (or the Apple key). These keys are slightly different on a Windows setup, but work the same. The other cool Intuous-only feature are the Touch Strips, which are touch-sensitive areas that you can run your finger up and down to scroll. They can be customized to do anything from Zooming to ther keystrokes as well. They work OK, but not great, and they also require you to use two hands with the tablet & pen. There are two issues I have with the Intuos tablets, as much as I love them. First, selecting points on Illustrator vector paths can be a frustrating hit-or-miss experience. I actually think it has more to do with the newer, higher resolution monitors out nowadays. Even Adobe has decided to help us out in the new Illustrator CS3, in which the anchor points will magnify on mouseover. The other issue is that of scrolling. It’s odd to not have a scroll wheel or ball on the tablet or pen, and would probably be weird if they did this. The Touch Strips mentioned above definitely cover this area, but now we’re up to a two-handed approach. The Touch Strips can bve set up to be activated by the pen, but you end up losing your pointer on the screen and it just gets more complicated than you want it to be. I emailed Wacom about this, and even suggested a shareware Mac application called Smart Scroll X that has a nifty feature called Grab Scroll, where you set up a key combo that when pressed, you “grab” the area of the screen underneath and can move the pen (or a standard mouse) to scroll the window. Since the Wacom pens have two programmable buttons on the side, I set the SmartScroll Grab Scroll feature to “Mouse Button 5” and then set one of my Wacom pen buttons to activate “Mouse Button 5”. It works great and I wish Wacom shipped with something like this so users could work almost one-handed when not working in a graphics program. It gets tiresome, after using mice with scroll wheels for so many years, to have to go back to finding and dragging the scroll bar in application windows. Using another hand to use the Wacom Touch Strip is not an ideal solution in my opinion. UPDATE: New Wacom driver software has been released, adding a basic version of this functionality! But be sure to read why I think Smart Scroll X still has potential in your workflow (I use it myself). I have also discovered that xGestures, a cool gesture-based input program (which needs a review all on it’s own) has some sort of conflict with the Wacom tablets. It eventually messes up your menus after a while of use. I used to swear by xGestures, but the Wacom takes precedence. At the time of this writing I have never heard back from the developer after bringing this issue up to him. Who knows, it could just be something with my system and all the other little utility programs I have running. Well, that’s it for this review. I really wanted to get more into the cartoonist, artist and illustrator side of things with the review as opposed to a breakdown of all the features. If you have been considering one but have wavered on the price, let me tell you that once you use these for an hour you will never think again about the price. You will love it that much. Hey, thanks so much for this! It’s very helpful and I have been thinking about buying one – but don’t know what kind of size – you’ve certainly cleared up a lot of things. Cheers. This is a great review! Thank you; I’m saving this website article to my desktop to keep it at the ready. Trying to work to get into the cartooning “industry” while working a full-time (plus) job is par for the course for many of us, and I can see where the time-saving nature of the Wacom (way-com!) tablet will be extremely important. Jeff – I hear ya on the Way-com pronunciation. I was thrown off when I first learned how to properly pronounce it, it just didn’t feel right. Glad the review helped out. Best of luck on the cartooning. The usual advice applies here – keep drawing and keep at it! Drop a line when you have some catoon work up on your site. I hope your wait isn’t too much longer. Get ready to be very pleased by a purchase! You bring up a good point regarding the acclimation period, which I should have addressed in my review. There are two issues to contend with. One being the hand/eye disjoint from not working directly on paper/canvas etc. For me this was not an issue as I have been working digitally for quite some time now in my art. If using the vector pen tool isn’t the most obtuse way (initially) to create lines and shapes, I don’t know what is! That said, I now find it as fast or faster than working by hand. If you are not used to working on the computer as far as artwork is concerned, this might be an initial issue. The second — and I think the more pronounced — change in my working habits derives from the fact that you need to keep the tablet squared up in front of your monitor, and you no longer have the “luxury” of rotating your drawing surface. I do this all the time on paper to utilize the natural arc of my hand’s drawing strokes to create fluid curves. I am about a year into using the Intuos3 tablets, and I would say that just in the past few months I have really gotten into the swing of things. One thing though is that I have also been using the Intuos3 & Photoshop much, much more to sketch than I had in the past. My old work habits were: sketch, refine, scan, tweak, print, sketch, vector. More and more I have been only working up rough sketches on paper, and so spending much more time using the pen & brush features in Photoshop and training my hand. However, these are really minor changes in technique, and should disappear the more you use the tablet. I will say that it took a month or so, sketching maybe 2 or 3 days a week for a few hours or so to get into the groove. Drawing/sketching and vectoring were still light years ahead of what I was doing pre-Wacom, but it was still a bit awkward for a while. Really, the most difficult part was accepting that the tablet was not going to be rotated or angled, and train my hand to work this way as well as the way I had been working prior. Fingers (and tablet styluses) crossed that you Wacom arrives shortly. And please report back on your impressions once you’ve had a chance to work with it for a few days. It would be great to get a brief progress update from you. I think you are going to be blown away! I just bought one of these and am still waiting on it to arrive. But I am seriously starting to get a little impatient reading all the amazing reviews of the intuos3. How long of an acclimation period did you have with using this form of input the first time? Thank you so much for your review! I really want to start working in vector graphics with my art, and this sounds like the direction to go in. I know what will be on my birthday wish list now! Don’t let the current lack of a tablet stop you from getting started in vector graphics. The tablet helps for sure, but even with a mouse you’ll love it once you get the hand of the pen tool. Thanks for all this great information on tablets George! I want one!! Does the tablet need to be flat to work with it, or can you use it on your lap at an angle? Say you place one of those crappy jpgs in an Illustrator file, can I then recreate it by “tracing” over it with the tablet pen? I have spent all afternoon searching for information about the Wacom table, or drawing tablets and it’s uses, and your post was by very informative. Thank you! Glad the share and help. You’ll love the tablet! The tablet stylus just moves the mouse pointer as a mouse would, with the difference being that you have the tablet and a cordless stylus (pen) to move around. So everything in Illustrator works the same way (except you get the added bonus of pressure sensitivity for certain brushes through Illustrator!). You can rest it anyway you like — on your lap, propped up, etc. I find it easiest to just have it square in front of my monitor though. Your drawing hand will take a bit of getting used to the positioning of your hand and wrist. A couple weeks of using it daily and it will become second nature. And I should note that when using my smaller Intuos with my laptop, I place it to the right of the laptop (I am right-handed). Yep, just like you would do with the mouse. The tablet/pen combo just replaces the functionality of the mouse. The pointer and all your graphics software tools will all work just as they did when you used the software and tools with just a regular mouse. Thanks, and very glad to hear. I wrote this post up specifically because I had a difficult time finding a review that dealt with using a Wacom graphics tablet Adobe Illustrator in particular. I love working with the tablet in Illustrator, and as I have mentioned before I rarely even use my mouse at all anymore, even for non-graphics software. It’s pretty much Wacom all the way! Hello George. Thanks for the information, it really helped me to make my decision. I purchased a Wacom Intuos 3, 6X11″ this evening. I’m looking forward to getting it into my hands! We met on Zazzle some time ago, I’m maxgrafix in that world. How’s Zazzle been for you? Keep in the limelight. @T Mac — Glad to help. In my mind, you just can’t go wrong with a Wacom. I am sure you got a great deal on the Intuos3 now that the Intuos4 tablets are out, but the Intuos3 is still a great purchase. I’ve had a tablet for almost 2 years now (Intuos3 and Bamboo Fun) and in all of my searching, have never found anyone on the internet explain how to use one for vector art beyond clicking points with the Pen tool. If that’s as far as its functionality goes, I might as well use a mouse. My question is, is there no way to actually draw things out (for example with the pencil tool) and then fill them? This works in Flash, but drawing in Flash isn’t much fun. @David — Indeed you can draw freehand if you prefer. Just use one of the brushes or build your own. There is plenty of documentation in the Adobe Illustrator help files if you look under “Brushes”. I find it much easier to create vector shapes by hand, and also using a Wacom, but that’s just personal preference. Is there a night and day difference b/w the STM Alley with and without the Absolute shoulder strap? The standard strap is just that – a standard nylon strap with a meager shoulder pad. The Bihn strap has a wetsuit-type material for the fixed shoulder pad, an it’s attached with elastic. The difference seems subtle until you use the Bihn strap for a while and then go back to a standard strap. The comfort is that much better with the Bihn. I’ve had mine for years now and the Bign strap is still in great shape, although I’m not working mobile as much as I used to. The STM bag is showing a bit of wear & tear, but nothing major.